We are an arugula loving family. There is always a bag of baby arugula in our refrigerator to toss into salads, soup, pasta or on top of pizza. I created this Arugula Strawberry Salad so that the arugula could shine. It definitely deserves star status in our home. The beauty of this creation is the strong contrast of flavors. 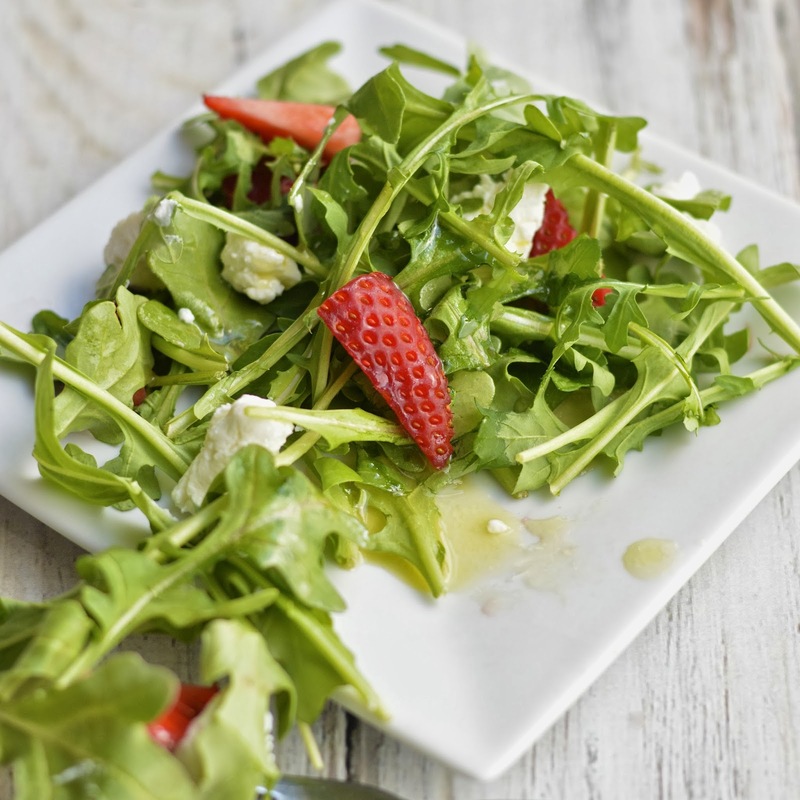 You have tangy and slightly bitter arugula paired with sweet juicy strawberries. The creaminess of the goat cheese and acidity of the vinaigrette tie all the ingredients together into perfect harmony; just like a beautiful song (OK that was super corny!). I usually don’t add sugar to my salad dressings, but I did think this dressing would benefit from the sweetness of honey and a touch of Dijon to highlight the flavors in the arugula. In all of the dressings I prepare, I use a two to one ration of oil to vinegar. For example, two tablespoons of extra virgin olive oil and one tablespoon of balsamic vinegar. I love this balance and it lends just the right amount of tartness to your salad. The best part about this salad – it’s so pretty! 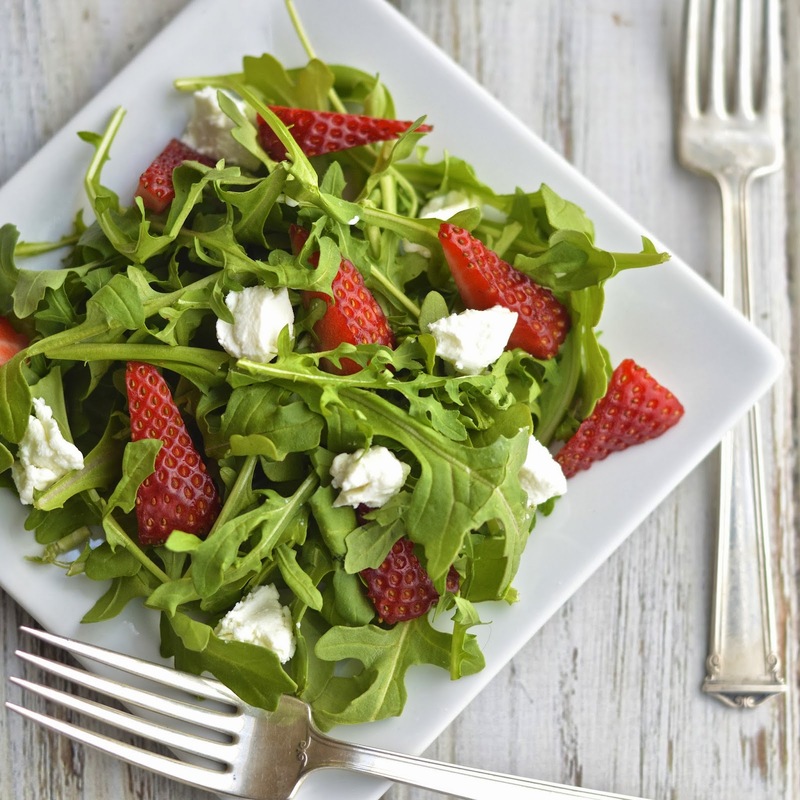 The ruby red strawberries, dark green arugula and stark whiteness of the goat cheese make such a pretty trio. It’s a treat for the eyes and palate. In a medium bowl whisk the first five ingredients until emulsified. 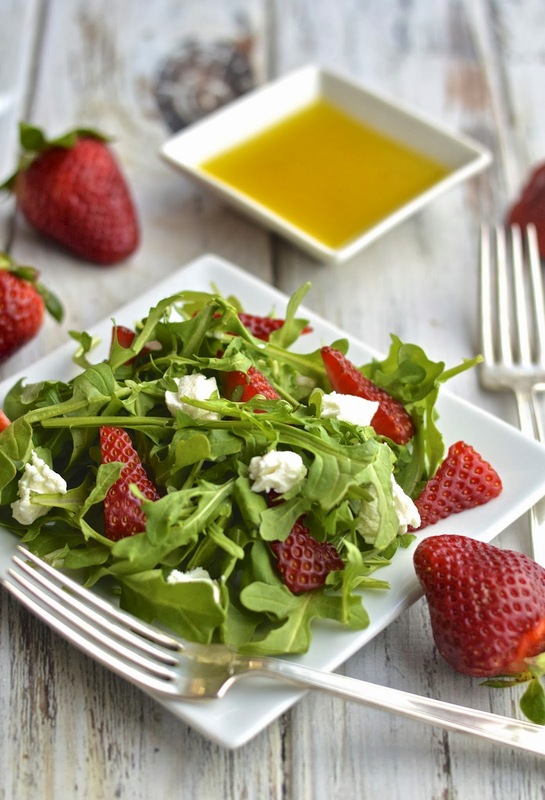 In a large bowl combine arugula and strawberries. Top with crumbled goat cheese and toss with desired amount of dressing. Any leftover dressing can be stored in an airtight container, in the refrigerator, for up to a week. Top with fresh ground pepper to taste.